For those who hate gardening! Many people hate gardening! This is amazing to those of us who have spent long years dabbling in the dirt – but it’s true! They hate the very thought of planting and weeding, hoeing and mowing. The acquisition of some new and rare plant species does not excite those who get their thrills from a new pair of designer shoes or a set of golf clubs. And, indeed, why should it. Gardeners are a mad breed and probably very boring to those who don’t find greenfly or the latest azalea variety an enthralling topic of dinner party conversation. So, I wrote a book especially for those who find gardening a chore and a bore. I thought it was the least I could do, being one of the mad breed who would rather have a new pair of secateurs than a pair of Jimmy Choos. Because, you know, I have noticed one strange thing in my years of writing and talking to people – even those who wouldn’t be caught dead at a rose show still like to possess a good-looking garden. The book is called How to Have a Great Garden for Just Two Hours a Week ( www.wix.com/jrlakemedia/ezibooks ) and it’s proving rather popular with today’s post-yuppie, cashed up, mega-consuming, time poor home-owning generation which will spend a fortune making the inside of the house look like a Home Beautiful cover and wants a garden to match – but without spending a lot of time and money on it. The secret of this book’s success is that today’s young (and youngish) home owners want solutions that are quick, easy, accessible and cost-effective. Not for them the good old stuff about making compost and improving the soil and hunting slugs by torchlight. They want a garden they can show off to their friends and neighbours and which can easily be kept going – and growing – in those little niches of time still found between work and leisure. And of course it’s an e-book so it can be easily downloaded to e-reader or tablet or phone – today’s home-owner is as likely to be found in the garden with a phone in his or her hand as a spade! As it says in the beginning of the book, here you won’t learn about grand design or formal versus informal gardens. Nor will you learn about the challenges involved in growing rare and temperamental plants. Nor will you find anything about elaborate water features or espaliering fruit trees or the finer points of plant propagation. 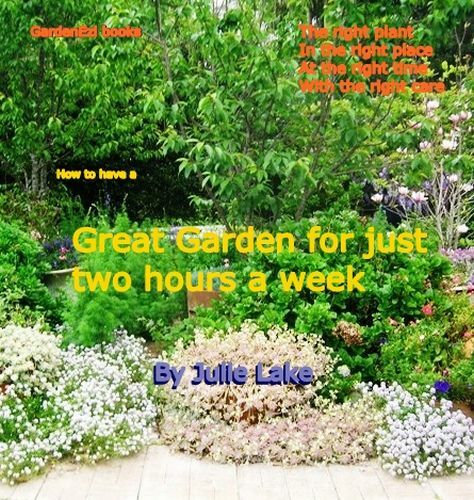 What you WILL find is lots of easy information on how to create a really good-looking garden – and how to maintain it for just TWO HOURS A WEEK! What it all comes down to is planning. Get that right, I tell my readers, and the rest falls into place. Thus I take them step-by-step through the planning stage, teaching them to think of garden features (lawns, flowerbeds, furniture, trees) in terms of modules than can be added to or subtracted from a simple plan. This type of modulised thinking makes it easy for people to envisage the type of garden they want – and just how much work each module means in terms of maintenance. When people have very little time for gardening it is just SO important to show them how to spend that time as effectively as possible because otherwise it is just seen as an added burden to an already over- burdened life. Whereas I want my readers to see gardening as a relaxing pastime that’s just as lifestyle-enhancing as all those more expensive ways of getting exercise and relieving stress, such as yoga or going to the gym. Above all, I want them to see it as FUN! Once I’ve shown readers the benefits of formulating and following a basic plan, it’s easy to lead them through the other steps in the process of creating the ultimate low-maintenance garden – Preparation, Planting, Practice and Protection. These are in fact the Five Principles (I’m tempted to say “the Five SACRED Principles!) of the GardenEzi gardening program which I founded some years ago. When it comes to allocating just two hours work a week to the garden, planning also has to include selecting the right infrastructure such as fencing, paving and edging. Preparation means buying the right tools and labor-saving devices. Planting means choosing the right plants and putting them in the right place. Practice means developing the right ways of doing things around the garden. Protection means learning the right – and easiest – way to keep plants healthy. In fact this book is so much about being right that the Tea Party would probably endorse it! Perhaps the book’s most important feature is the Time Budget, by which readers are shown how to allocate and spend gardening time in the same way as they would (or should!) budget their money. Follow this and you’ll come to see a couple of hours a week spent around the garden as a pleasurable workout rather than a chore. I’ve had a lot of fun over the years, telling people how to garden, and mostly I’ve been preaching to the converted. It’s been a lot more of a challenge preaching to the UNconverted – to those who hate the very thought of gardening and need guidance just to establish a lawn and a couple of shrubs. Yet it’s been very rewarding to hear from people who have turned dull, weedy plots into stylish and much-loved outdoor rooms by following the simple steps in Great Garden for Just Two Hours a Week. I truly believe that if each one of us could just find two hours in our busy lives to spend in the garden we’d all be a lot healthier and happier – and the world would be a better and more beautiful place. Bob and I so much enjoy sharing our gardening and camping knowledge with you on our blogs and websites and also exchanging chat about Africa on the Facebook group Kenya Friends Reunited. We’re also happy to help people planning to visit Australia with free advice on where to go and what to do, particularly if they are campers, birdwatchers, hikers or nature lovers of any kind.